BANGI, 5 Nov 2012 – Islamic entrepreneurship when combined with Islamic Economics and Islamic Finance has the potential to create a new economic world order that upholds social justice for all. 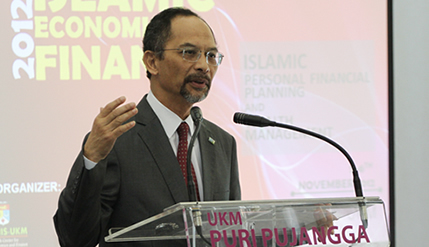 The Chief Executive Officer of Islamic Banking and Finance Institute (IBFI), Dato’ Dr Adnan Alias said the new economic world order is not something to be feared as it is based on Islamic principles which are universally accepted. He was giving his keynote address at the Conference on Malaysian Islamic Economics and Finance 2012 jointly organised by Research Centre for Islamic Economics and Finance (EKONIS) of the National University of Malaysia (UKM) and Islamic Science University of Malaysia here today. The two day Conference is to discuss issues in Islamic wealth management and Financial Planning, as more and more Muslim are becoming wealthy. Dato’ Dr Adnan said the new economic order maybe a distant reality but is not impossible given the current economic scenario in Europe and the United States which are looking for a more stable solution to their economic problems. He said unlike conventional entrepreneurship where philanthropic activities only come about in the later stages of it, in Islamic entrepreneurship philanthropy comes at the very onset of the entrepreneurial activities and grows with the business. In Islamic system social justice is paramount right from the outset instead of entrepreneurship merely for profits. He said while there are countries taking a lead in Islamic Economics and Islamic Finance like Pakistan and Malaysia, there is a vacuum when it comes to Islamic Entrepreneurships. He urged the government to play a central role in such a development as only then will the private sector follow suit. Dato’ Dr Adnan admitted that Islamic Economics is not free from problems. It is no secret that there are countries that claimed their system is more Syariah compliant than others. In the area of Islamic Finance, for example, there is divergence between countries like Malaysia which innovate Islamic financial products and countries in the Middle East which have a very strict standard of compliance. This, he said, has to do with cultural differences rather than interpretation of what is Syariah compliant. While it is normal to disagree on things it should not stifle the growth of the Islamic system. The Islamic system can provide a more socially just mechanism for financing business, where debts do not grow exponentially like overtaking returns on investments. The conference is chaired by the Secretary of Ekonis, Dr Suhaili Alma’amun. Prof Dr Hajah Mustafa Mohd Hanefah, Dean (Research and Innovation) USIM attended the conference together with participants from Sudan, Iran, Indonesia, Brunei, USA and Malaysia.